I started a new job in Irvine in May, which is partly why I neglected this blog for about a month and a half while I was busy acclimating to the new job. One of my happiest days was when I literally stumbled upon Fukada 2 Go, just a mile away from my job. 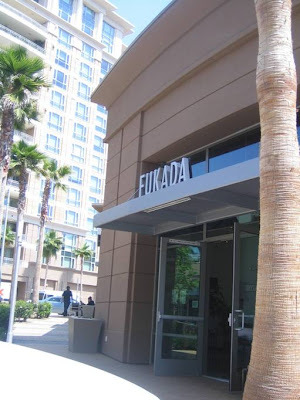 I already knew about the main Fukada, the fast-casual Japanese place near Irvine Spectrum. People wait close to an hour there to slurp the handmade udon and enjoy other Japanese comfort foods like unagi bowl and spicy tuna bowl, all made authentically delicious with fresh, often organic ingredients, and so affordably priced it puts other Japanese restaurants to shame. But I had no idea there was a Fukada outpost hidden at the base of a gleaming high-rise condo complex at Jamboree Road and Campus Drive - until I turned into this complex, drawn by a sign for a Vietnamese eatery. Fukada 2 Go has apparently been open for about 8 months now. It's a small place with seating for maybe 10 diners - it's "2 Go," after all. 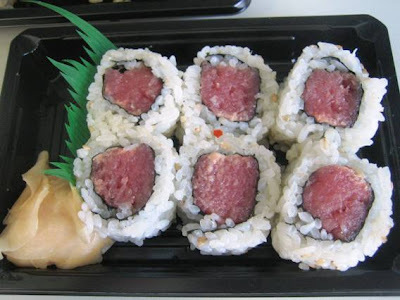 You'll see by the menu, available online, that there is definitely more "2 Go"-friendly food from Fukada's main menu: rolls and rice bowls, plus bento boxes, all for an average $5! In fact, when I first came upon Fukada 2 Go in May, they weren't serving the signature udon - which made sense since noodle soup isn't takeout fare. But apparently there was enough customer demand - or the owner was waiting to see how business went before offering it here - because in June, handmade signs proudly announced "Udon now available!" They've also recently added tako-yaki - Japanese dumplings made of flour, tempura batter, diced octopus, red ginger, and green onion, topped with sauce, seaweed, mayonnaise, and bonito - on weekends. Fukada 2 Go is clearly the place to go for lunch - especially if you only have an hour break. Unlike the main Fukada, there's no line of people waiting to get in, and actually very few diners there whenever I've stopped in (both at lunch and after work). 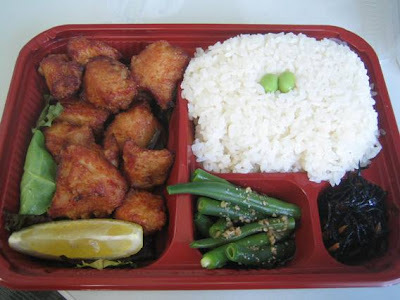 The kara-age bento box, featuring the Japanese fried chicken (marinated in soy sauce before fast frying), with rice, sesame green beans (gomae ingen, a homestyle favorite) and my favorite hijiki (a type of seaweed stewed with carrots and fried tofu pieces). All this for only $6! Though I should warn some of you that they serve Japanese-style portions here - just right, in my opinion, but perhaps not enough for some American appetites. But then, you can order more, and still not break the bank! In fact, I love the sides so much that I often order several of them. 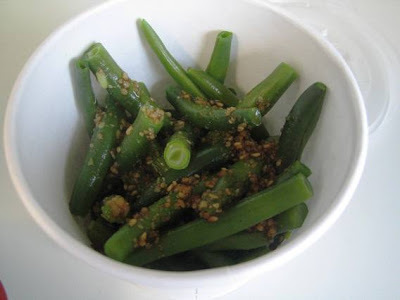 The sesame green beans are especially perfect: the soy sauce and brown sugar in the sesame mix are nicely balanced, not cloyingly sweet; the sesame seeds are not pulverized to a pulp; and the beans are boiled but still firm. 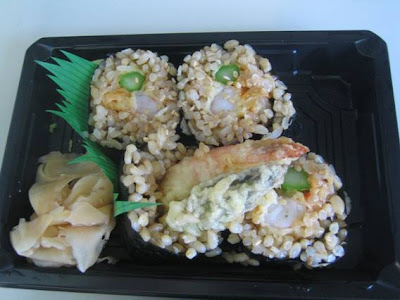 I ordered it once with the brown rice, which didn't work for me: brown rice has such a distinct flavor, not just nutty but more robust, so it actually clashes with the spicy tuna roll. The udon here comes in two sizes: a nice smaller cup (about the size of a large mug) that satisfies me perfectly for $5, and a larger size, about the size of a regular soup bowl, that will probably satisfy most other diners for about $7. 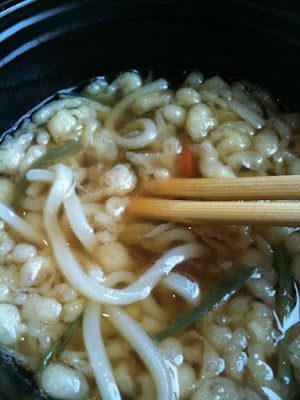 The basic udon here comes topped with both the tempura crumbs and sansai - often a mix of Japanese seaweed and "mountain vegetables," typically green-bean-like root veggies and mushrooms. 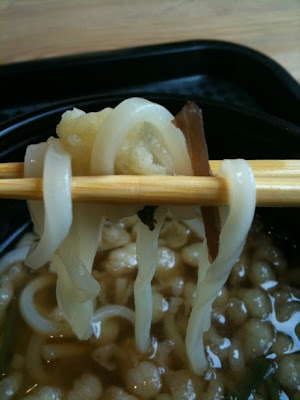 Those handmade noodles are sooooo good, slightly chewy yet delicate. I must admit that while the small bowl is really the right portion for me, I'm always disappointed there aren't just a few more noodles when I get to the end of the bowl. The black sesame looks - and tastes a bit like - chocolate chip ice cream, but with a very slight nutty or bitter edge, but in a good way, like how coffee has that deep roast flavor. 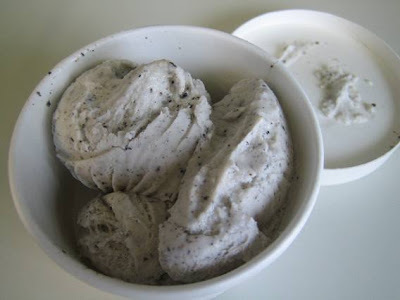 If you're like me and don't like super sweet, you'll order the black sesame ice cream again and again. MMmmmmm, made me hungry! I like your descriptions of price and portion size. . really helps with the overall sensations!